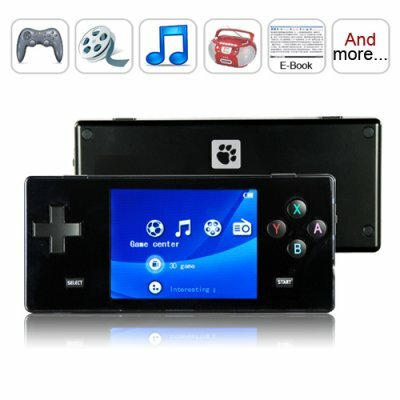 Successfully Added Multi Platform Portable Gaming Entertainment Station (Black) to your Shopping Cart. Multi-platform handheld gaming entertainment station, which is often lovingly called the Delightfully Small (DS) gaming entertainment system. Our popular portable gaming system - now available in black and the latest firmware to make a great product even better than ever! Remember all those classic video games from the 80's? Nintendo, Sega, Neo-Geo and Capcom from the dawn of console gaming? Now you can play them again in an easy to use hand held form factor! The CVFH-N03-4G is the portable emulator system we have all been waiting for - it comes with a proper control pad and buttons along with a huge 4 GB internal memory! Capable of storing thousands of cool videogame ROM's from the most popular 8-bit and 16-bit systems, this ultra-fun device is capable of keeping even the most demanding gamer entertained for the next ten millenniums. A great wholesale price makes the CVFH-N03-4G-BLACK perfect for the resale market, VAR and OEM market, or simple personal use. As always, it is in stock in our warehouse for immediate shipment. Place your order today and we will express ship it out tomorrow! There are actually two great videos for this product, check out both [http://www.youtube.com/watch?v=ngD6pbacHSU] and [http://www.youtube.com/watch?v=iuJCft56cy0] to see it in action for yourself! First purchase off Chinavasion, can't believe how fast it came! Across the world in three days. I have seen some doubt on varius forums over wether the chinavasion dingoo's are fake or not. They are the real thing, mine works perfectly and has the pawprint on the back. Came precharged, with an adapter for my country and with a free gift in box courtesy of chinavasion! OVerall very impressed and will be buying alot more things from here in the future. TOP STUFF!! on 2010-06-15 00:05:20 Best gadget ive ever bought ! I bought this to resell, but it looked so cool I decided to keep it for myself. The system is made very well, the screen is bright. I actually like this better then PSP. everything else works great , all emulators work good. I am in the process of installing Dingux whice is a LInux for Dingoo. this is a very awsomw console i reccomend it to anybody! This is a great product. I got it within three days. It works perfect. I still can't believe how extremely this gaming machine is and it's so little. I highly recommend this for anyone that is into retro games and loves "Media on the go". Chinavasion is one of the best electronics company out there. I always recommend electronic junkies (such as my self) to this place. I ordered the device on a Saturday afternoon. It arrived in New Zealand the following Monday afternoon. Thats super fast!!!! The Dingoo is an awesome device. So many uses and there are so many things you can customize. Good development community for both Dingoo and Dingux. I highly recommend buying one. You _won't_ be disappointed.